ARM stands for Advanced RISC (reduced instruction set computer) machine. 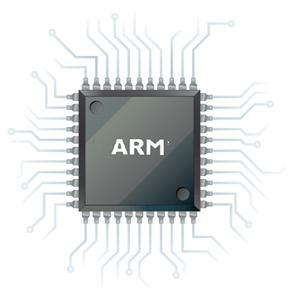 ARM started life as part of Acorn makers of the BCC computer, and now designs chip for apple iPad. The first ARM was established in Cambridge University in 1978. The Acorn group computers have developed the first ARM commercial RISC processor in 1985. ARM was founded and very popular in 1990. The ARM using more than 98% of the mobile phones in 2007 and 10 billion processors are shipped in 2008. 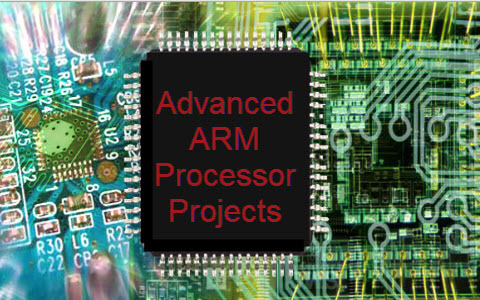 ARM is the latest technology which replaced by microcontroller and microprocessors. Basically ARM is a 16 bit/ 32 bit Processors or Controllers. ARM is heart of the advanced digital products like mobile phones automotive systems digital cameras and home networking and wireless technologies. ARM is the most popular processors, particularly used in portable devices due to its low power consumption and reasonable performance. ARM has got better performance when compared to other processors. 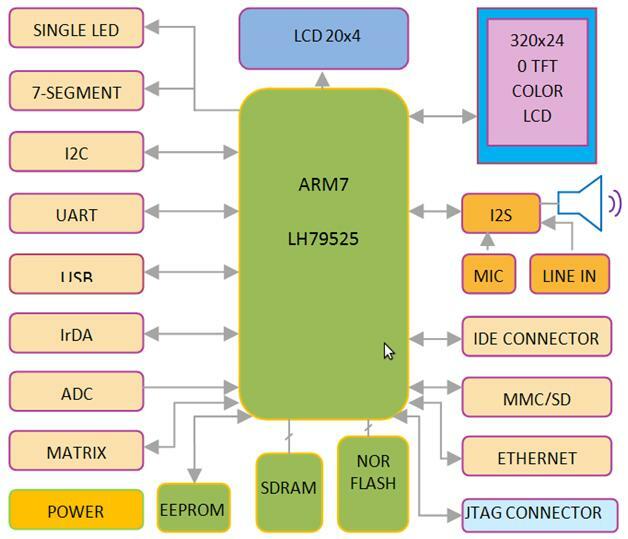 The ARM processor is basically consisting of low power consumption and low cost. It is very easy to use ARM for quick and efficient application developments so that is the main reason why ARM is most popular. Multiple data support (like 32 bit=32*32=64). ARM is a load store reducing instruction set computer architecture; it means the core cannot directly operate with the memory. All data operations must be done by registers with the information which is located in the memory. Performing the operation of data and storing the value back to the memory. ARM consist 37 register sets, 31 are general purpose registers and 6 are status registers. 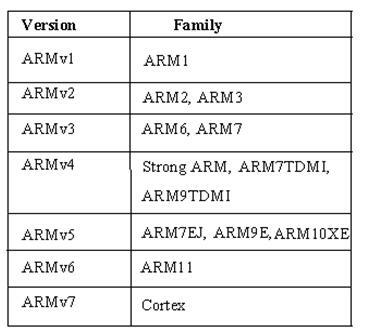 The ARM uses seven processing modes that are used to run the user task. The user mode is a normal mode; which has least number of registers. It doesn’t have SPSR and limited access to the CPSR. 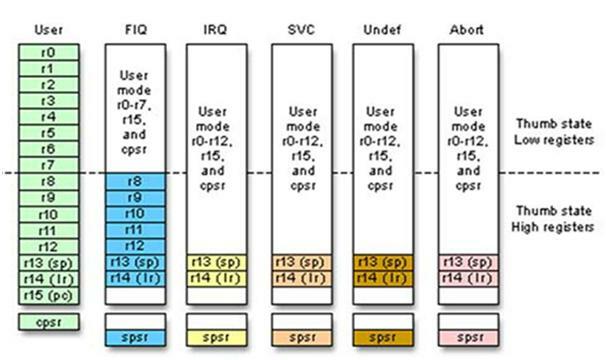 The FIQ and IRQ are the two interrupt caused modes of the CPU. The FIQ is processing past interrupt and IRQ is slandered interrupt. The FIQ mode has additional five banked registers to provide more flexibility and high performance when critical interrupts are handling. The Supervisor mode is the software interrupt mode of the processor to start up or reset. The Undefined mode traps illegal instructions is executed. The ARM core consist 32-bit data bus and faster data flow. In THUMB mode the 32-bit of data divided into 16-bits and increases the processing speed. CPSR (current program status register). SPSR (saved program status register). The reserved registers are used for specific functions. The SPSR and CPSR contain the status control bits specific properties. These properties are defining operating mode, ALU status flag, Interrupt enable or disable flags. The ARM core is operates in two states 32-bit state or THUMBS state. Temperature is a most important parameter in the industrial applications. Accuracy of measured and controlled is very essential. More industrials transformers are damaged high voltage and over load and high temperature. Accuracy of temperature measured and controlled is high demanding. This Project is designed to interface the temperature sensor to ARM based microcontroller. 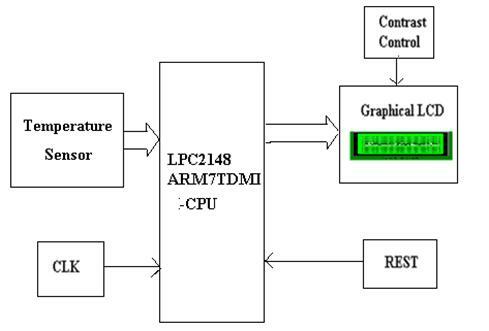 The LPC2148 is a 16/32 bit ARM7 CPU. The temperature sensor LM35 is an analog sensor, connected to the LPC2148 microcontroller analog channel. The slandered temperature values are pre-programmed in the microcontroller. The graphical LCD is connected to the microcontroller output pins. The temperature sensor monitors the temperature every sec. When the temperature is increased due to overload then the sensor sends the analog signal to the microcontroller .The microcontroller gives the alerts through buzzer and the LCD display. The LCD displays the temperature on screen. This application is used in industries to for safety purpose.